We have had a crazy baby boom in the last month. Everywhere you look there is some baby animal running around and trying to find its feet not too far from mommy. With winter over and summer in full swing the bush is lush, with enough food for the antelopes and the other herbivores. A healthy environment signals a good time for the little ones to be had. 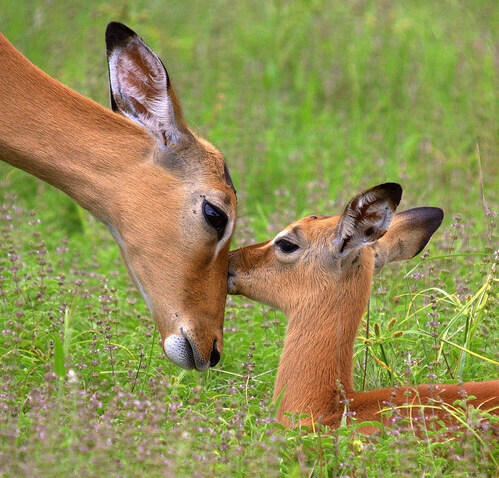 Antelopes like impala will all conceive around the same time as they have a mating season. As all individuals of the same species have a similar gestation period, this results in all the babies being born at the same time, essentially flooding the market for the top predators. It’s a great evolutionary adaptation as the predators are not able to take out all of those vulnerable babies at once, whereas if they were born consecutively throughout the year, it would be a different story.